It’s official! Fall is in full swing which means umbrellas are at the ready. Especially if you’re based in the Pacific Northwest like me where the rain is 100x crazier. 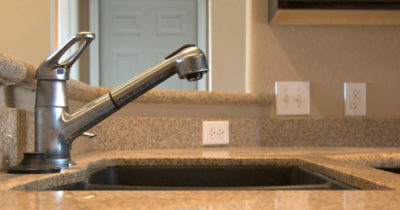 Anyone who has ever walked into my house has been either been greeted by umbrellas shoved behind the door, or been asked to kindly put them in the sink. I decided this probably isn’t the most practical or tidiest way to store umbrellas. While browsing the stores I was mortified by how much some umbrella stands sell for. So I decided to hit the web and see if I could make my own. 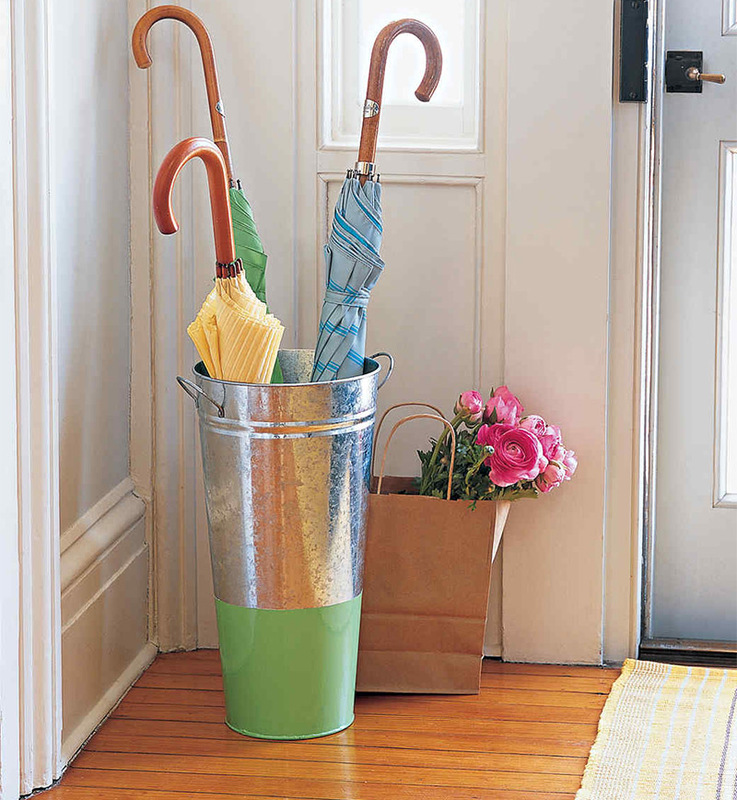 These DIY umbrella holders will keep your house dry and add a touch of style to your entryway. Jenny crafted this amazing monogrammed stand from a boring old thrift store find, but what I really love about it is the effort that actually went into the monogram design itself. She rustled up the design on Photoshop and then used tracing paper to create her stencil and paint it onto the stand. Pretty crafty! 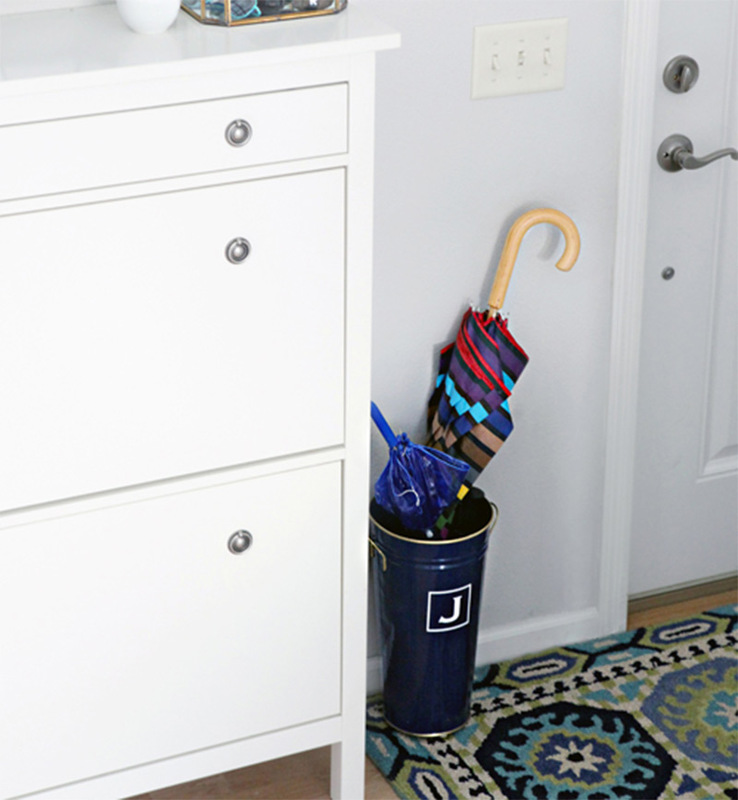 I love the simplicity of this umbrella stand project. 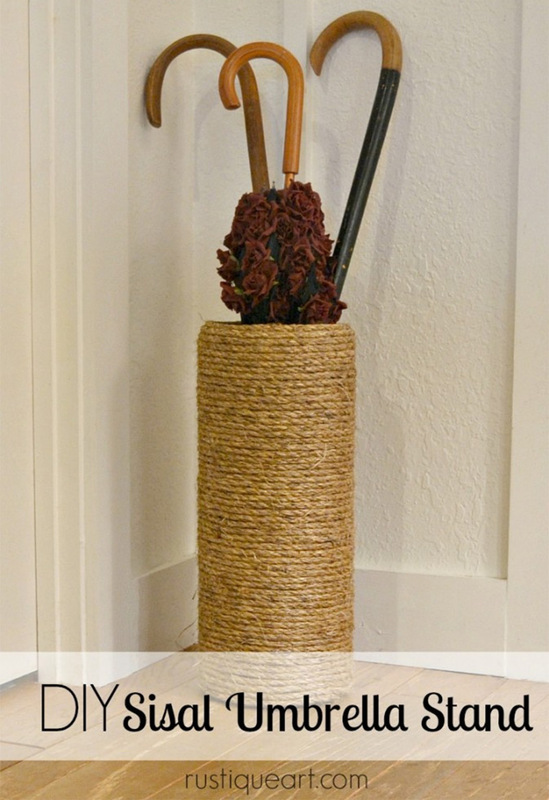 You just need a bit of rope and a glass vase(who doesn’t have one of those laying around). 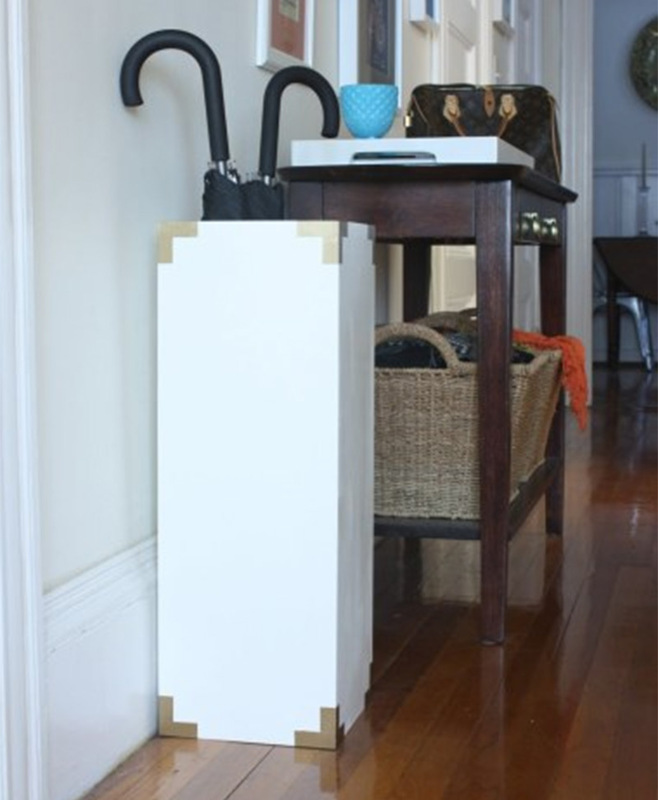 You can make this uber chic umbrella stand like Cindi’s within a few hours of work. And it looks 10x pricier than what it actually costs. 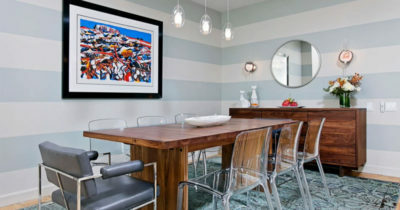 Another DIY paint job that could rival Picasso. And we all can’t always afford fancy brass trimmings for our home furniture projects. So what do we do to get a similar effect? Paint them, of course! 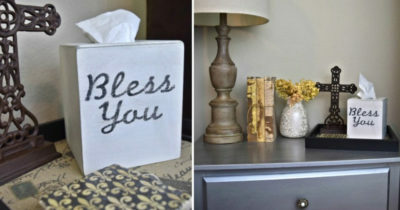 For those of you who aren’t too steady with your hands: find some free, printable stencils online. 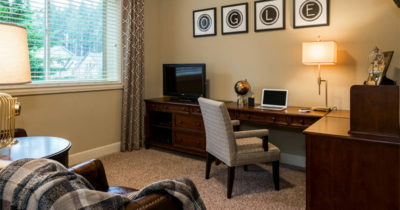 If the clean cut corners aren’t really your style you can try something a little fancier too. 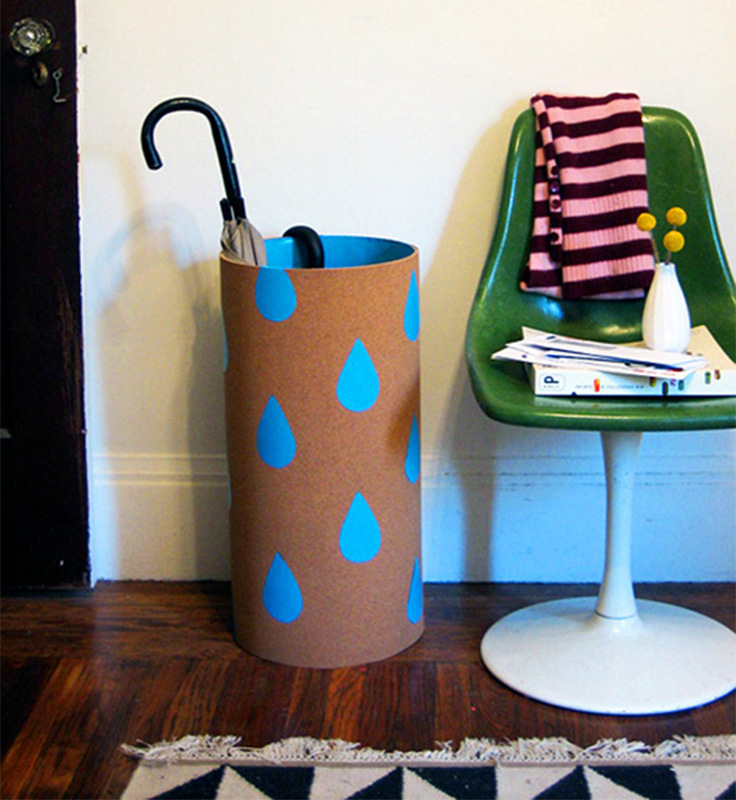 I love the fun vibe this umbrella stand gives off. Although the tutorial definitely requires more effort than some of the others, so it’s absolutely for the craftier folks out there. Also you’ll likely need a quick trip to the shop for supplies. Grace uses cork to help absorb the water in her design. The big blue raindrops really bring it to life and inject some personality into the stand. This has to be the most creative use of a stove pipe I’ve ever seen. 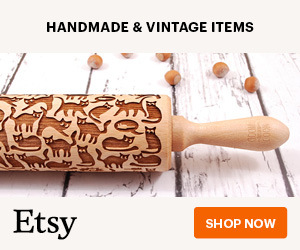 More importantly, it is super easy to make. 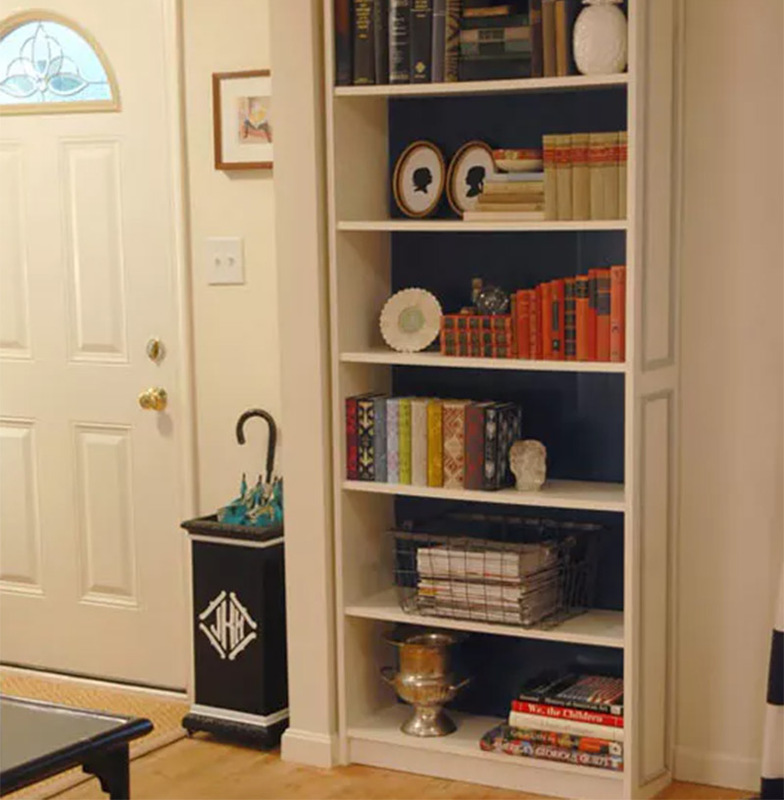 All you need is some wallpaper of your choice to transform this into a super stylish and functional entryway accessory that won’t break the bank. I was blown away by this idea from Chris who shared his process on Instructables. Who would have thought a watering can could be so versatile? This is a great project to include the kids on too. The paper mache from some newspaper adds to the effect. If you’re not really into newspaper, don’t worry. Simply choose another material that suits you. I’m thinking of making one using cut outs from a world map. 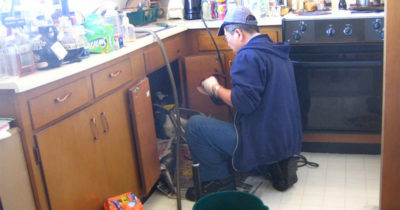 If you have any carpenters in the family, now is the time to give them a call. 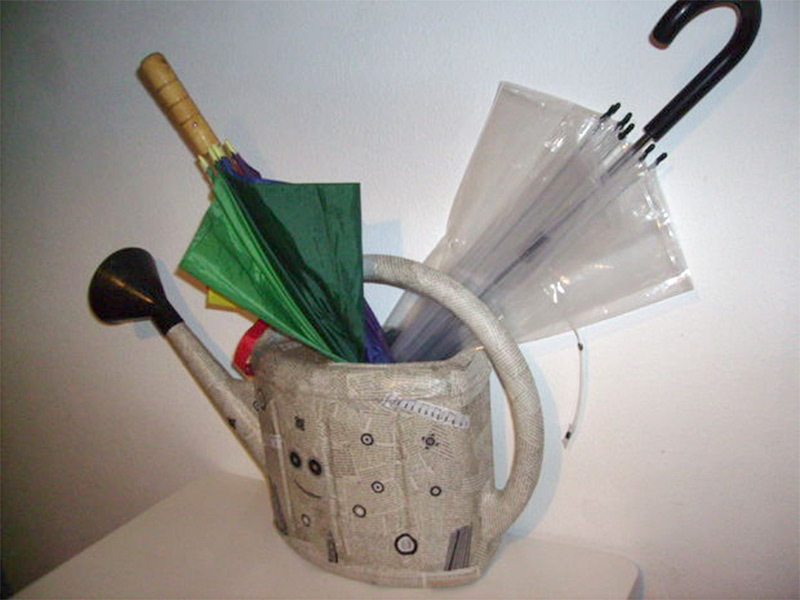 This umbrella stand is intricately made and requires a lot of tools. And the results are pretty epic. 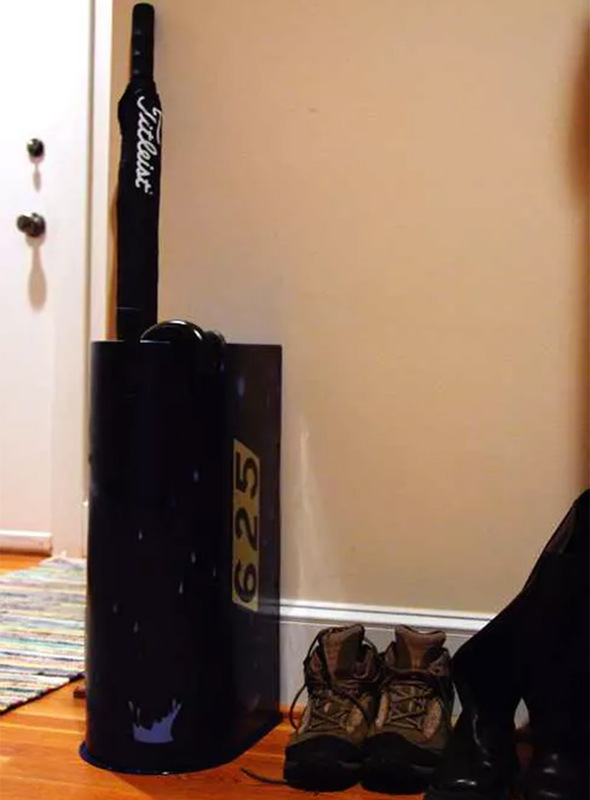 The greatest thing about this project is that it should fit comfortably behind your door. 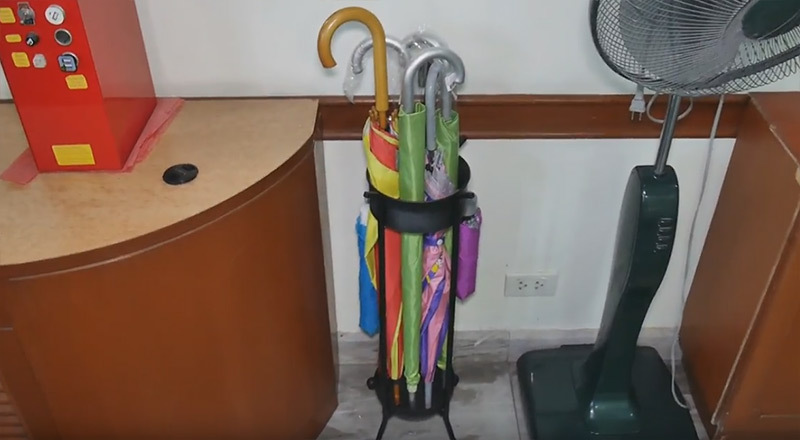 To be honest though, if I had put that much work into making my umbrella stand, it would be taking its place place where everyone could see it! The prior tutorial required some carpentry work, and this one requires some welding! 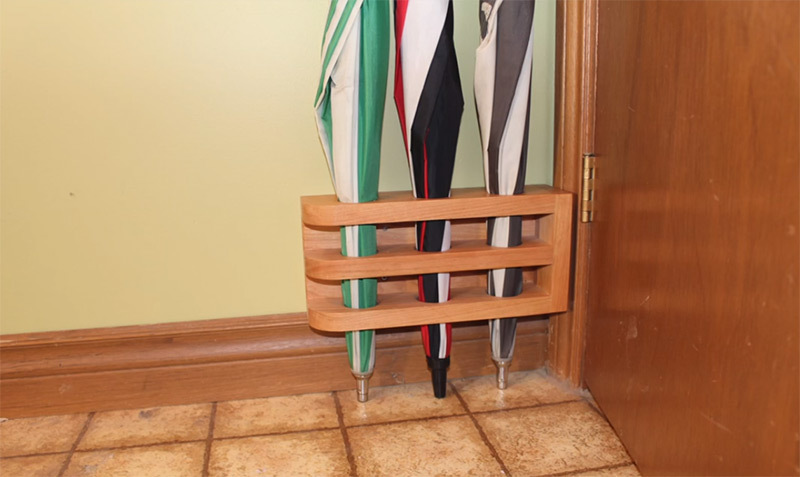 Just the idea of making an umbrella stand out of an old pan and a few steel bars makes me want to get straight to work. Once it’s painted it looks like a high end cast iron stand that could’ve set you back hundreds of dollars were you to buy one in a store. 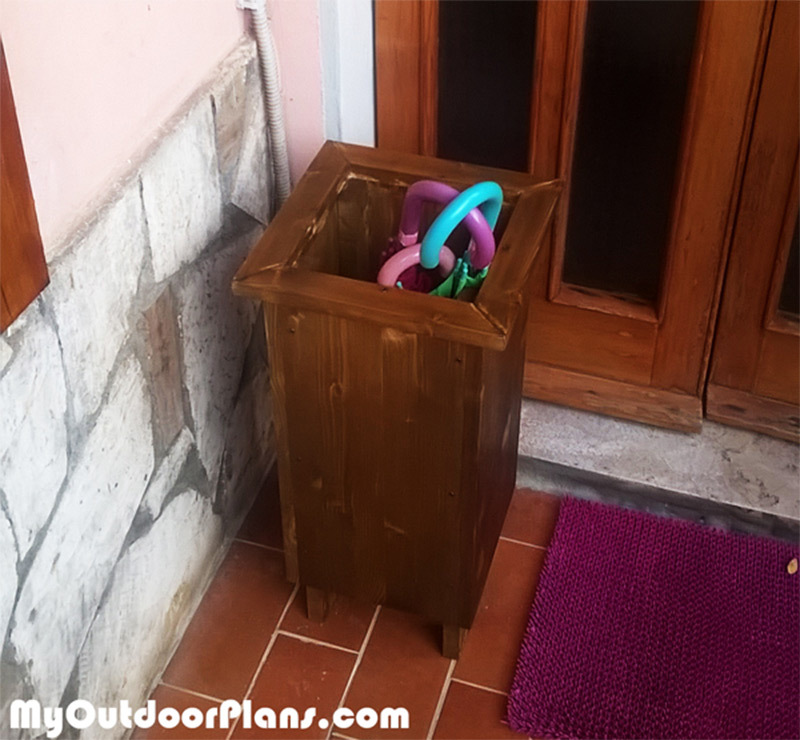 This is great way to upcycle an old mailbox and anyone can make it. Be sure to sand off any rust that’s still on there, then simply spray paint it with your favourite shade. It’s recommended that you use rust proof spray paint so the wet umbrellas don’t damage the mailbox. Smart thinking. I love how retro this thing looks too. 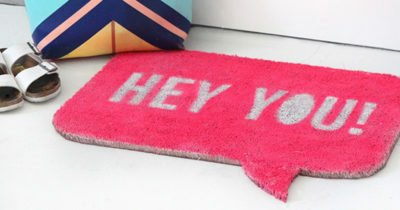 I want one in my entryway! 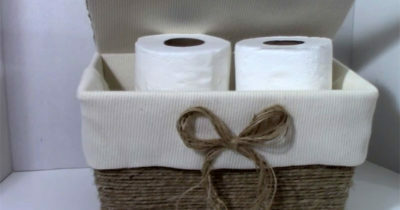 Here’s another very simple design straight from Martha Stewart that can be ready in a couple hours. All you need is a metal flower bucket(check out your local florist to see if they have any spares lying around) and some oil-based paint to decorate it. The great thing about painting the bottom of the vase is that any rust from the wet umbrellas will be hidden. If plain block colors aren’t your thing you can always think of another pattern. Even print a free stencil online if you like that idea. I love the classic design of this pine wood umbrella holder. 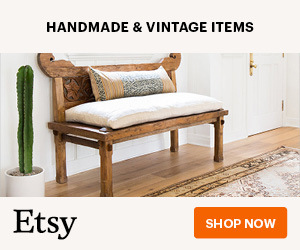 It’s certainly easy to make since you just need the wood which you can pick up from your local hardware store, and some stain for the finish. It is also really cheap and will only cost maybe fifteen bucks total. This style is perfect for inside or outside your front door. Out of my entire list I think this holder is one of my favorites. 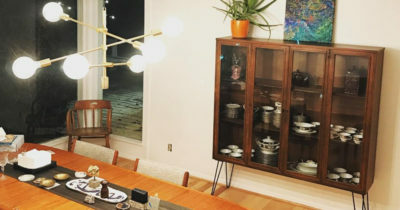 Jen got inspired to make this by a similar design she saw in a store that was charging $95! I know, crazy right?! Luckily she managed to pick up a metal vase dirt cheap and totally transformed it with some spray paint and liquid gold leaf. The main feature for me is the gold handles and the beautiful monogram. I just think metallic paint has a certain class that can’t be beat. Last but not least we have something super unique. This is one of the most creative ways I have ever seen someone use shutters. And thankfully it’s straightforward to make. 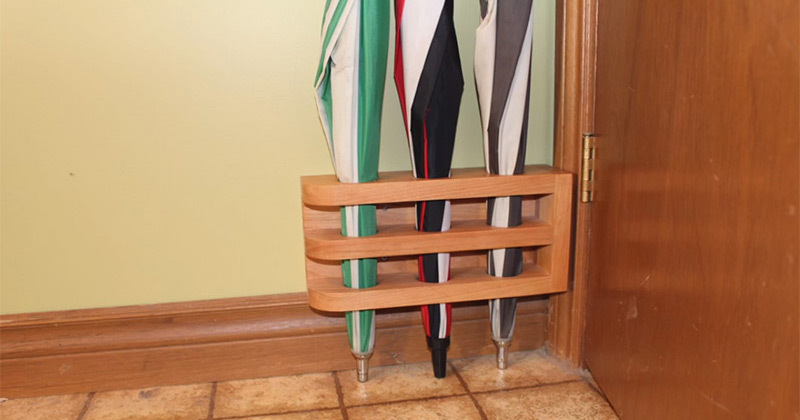 This little umbrella holder just requires some matching shutters and hinges to put them together. You will also need something to use as a base. A wooden board will do. The slats in the shutters ensure that the umbrellas get plenty of air and will dry up nice and quick.